Knowing the inner diameter of your coil spring whether it is compression, torsion, and sometimes extension, is very useful for various reasons which are going to be listed below. 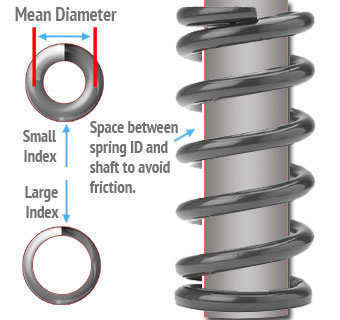 Spring index is required to know the tightness of your compression spring’s coils by calculating the proportional ratio between the coil’s wire diameter and inner diameter/outer diameter. To calculate this value you must first calculate the mean diameter which is the intermediate diameter between the coil spring’s inner diameter and outer diameter. To calculate mean diameter you must add one wire diameter to the spring’s inner diameter. Then, to calculate spring index, you must divide the mean diameter by the wire diameter. 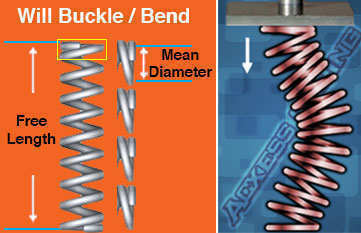 The slenderness ratio of a compression spring is the proportional ratio between your spring’s diameter and its free length. It determines whether your spring will be stable during deflection or if you run the risk of it bending or buckling. To calculate your compression spring’s slenderness ratio you will also need to calculate mean diameter first. Once you’ve calculated mean diameter with the previously demonstrated formula using the spring inner diameter, you must divide the free length by the mean diameter. If the result is over four (4) you run the risk of the spring bending or buckling. Knowing the inner diameter of your extension spring might be required in you have an extension spring without hooks. One of the cases in which knowing an extension spring’s inner diameter is important, is when you are going to put a screw or bolt inside it. Whether it is to use the bolt or screw as hooks or you’re using the extension spring to replace worn out threads in a hole where a bolt will be screwed. In this case, the threads of the bolt and the wire diameter must also be taken into note. Since the extension spring’s inner diameter must have good grip on the bolt on both cases, the inner diameter must be exactly the same as the outer diameter of the bolt. To calculate the inner diameter and compare it to the screw’s diameter you must use the formula provided in the definition which shows you to subtract two wire diameters from the outer diameter in order to calculate your spring’s inner diameter. The inner diameter of a torsion spring is highly important. This is because most of the time, a mandrel or shaft will go through this spring’s inner diameter. Therefore, you will have to make sure that the spring’s inner diameter will fit over the shaft or mandrel. You must also consider the fact that a torsion spring’s inner diameter shrinks during deflection so you have to be aware of how much the inner diameter will shrink under the deflection you expect your spring to travel so that the spring won’t clamp on the shaft. If your torsion spring’s inner diameter is too small, it will bite down on the shaft and won’t be able to travel any further. If the torque is still being applied after your spring’s inner diameter has already bit down on the shaft, you run the risk of damaging your torsion spring since you are pushing it beyond the limit. Our torsion spring calculator, Spring Creator, allows you to calculate your torsional spring’s torque as well as the inner diameter after deflection.